Relaxed in reclining seats and with the ambiance of a dimly lit room, astronomy lovers of all ages got to explore the universe in the planetarium at Pierce College’s Center for the Sciences on Saturday Oct. 11. Pierce College held its second Science Imaging and Astronomy [SIA] Expo allowing science and astronomy enthusiasts to connect and indulge in a world of telescopes, satellite images and three dimensional astronomical pictures just south of the Mall. 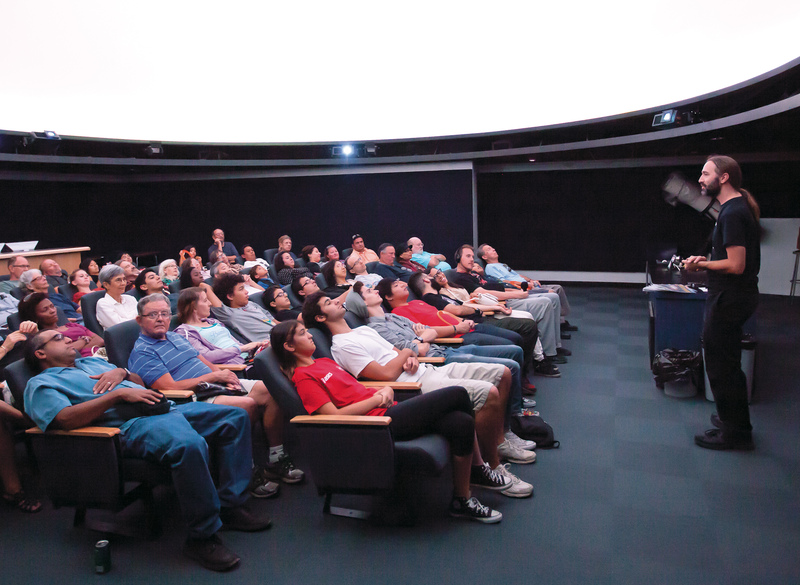 One main attraction at the SIA Expo was the Planetarium shows offered throughout the day that many gathered to expand and gain more knowledge of their universe and the world around them with Pierce College Astronomy Instructor Dale Fields. “The rest of the universe is an understandable thing,” Fields said. Fields tried to make the main goal of the Planetarium shows a way for people to see that our universe is not chaos and that it is something that we do have the ability to figure out and the capacity to understand. According to Pierce College student and physics and astronomy tutor Stavros Diamantopoulos, the planetarium show is always something attractive even if you have no clue about astronomy. “The planetarium is cool, and it attracts all ages,” Diamantopoulos said. The first show of the day was based on The Voyager and its missions along with analysis and photos of different planets in our solar system, space probes and their features. The third and only presentation about “Exploring the Universe” gave an in depth lesson of the world, planets, universe and galaxies around us. Fields said that he does more of the night time observations rather than the early morning events, like the recent blood moon this past Wednesday morning. Starting with a view of the sky and how the sun moves during the day from morning to night Fields began with an on earth view then zoomed out for a larger scale view of our home planet. “We could be the descendants of Martians,” Fields said. The planetarium shows were a way to gain some perspective on the multiple possibilities on our galaxy’s development and how the universe around us affects every aspect of life. Leaving viewers with a better understanding of life through short animations, pictures, different dimensions and views of the planets and their surrounding moons the some audience members were even able to pick out their favorite portions. “My favorite part was probably the pictures,” Moorpark student Paul Mauricio said. There were many things that audience members gained from the show. 7-year-old Pierce Groves a student from Blanche Reynolds Elementary School was one of the biggest enthusiasts in the crowd asking many questions and trying to fulfill his curiosity. “Can you bring dirt to Venus and then plant a tree and then in could filter the carbon dioxide?” Groves asked. According to Pierce Grove by going to the planetarium show he learned that our galaxy and our universe are bigger that we may think. “I know that Mars used to have a ton of water, but it used to be the most watery planet in the galaxy, but then an asteroid that destroyed all the water slowly,” Groves said. The Grove family came to the SIA Expo because of their son’s curiosity. Keith Groves heard about the expo while on his way to work and thought to come and check it out. “I heard about it on the radio,” Keith Groves who works for the Naval Satellite Operations Center said. One thing that Diamantopoulos enjoyed was that professor Fields stayed after the show and answered almost any question from the crowd and explained things to people which is way to bring them closer to astronomy. “As an astronomer part of my job is to remind you, of how important everyone here is,” Fields said.